The show Toronto Life, the Globe and Mail and CBC called Must see! and received four stars (NNNN) from NOW Magazine. 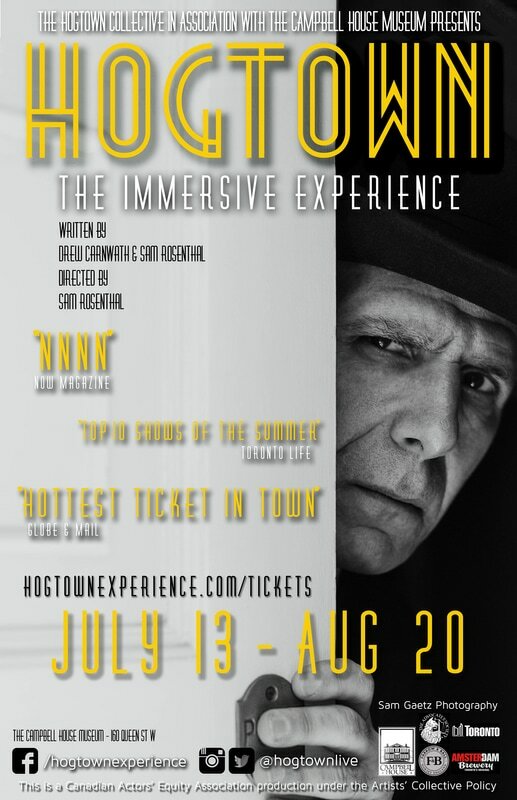 Hogtown is an Immersive Theatrical Experience featuring over twenty performers, with new music and original choreography. It is unlike anything you have seen, heard or felt at the theatre until now. It's the night before a critical mayoral election that will determine the future of the city. Although prohibition is still in full effect that's not stopping tonight's host, union boss Bob Delacourt, from opening the doors to the hottest gin joint in the city, featuring the White Hot Jazz Band (hint: its in the basement). Not exactly the place you'd expect to find the two front runners but tonight both incumbent Thomas Foster and his chief rival Councilman Sam McBride will make an appearance. Young flappers Toni and Lulu are crashing the party with dreams of becoming showgirls. Moonshiners Tanner and Jackson Busch are peddling their home-grown whiskey, thirsty for a sale. Theyre going to have to get past the Temperance Ladies, staging a desperate protest in the dying days of Prohibition, and theyre not going down without a fight. Finally, Mayor Fosters daughter Maddy Foster sings in the White Hot Jazz Band but tonight she's got a secret that requires the assistance of Canada's first female doctor, Libby Prowse. Add to the mix a house filled with power brokers and police, showgirls and gun molls, speakeasies and gambling dens and you have the world of our play. You choose the characters and storylines you wish to follow and no two performances are ever alike! Everyones got something at stake, a heart to break, or a deal to make. Let the party begin! We wish to acknowledge this land on which we are performing. For thousands of years it has been the traditional land of the Huron-Wendat, the Seneca, Anishinabek Nation, the Haudenosaunee Confederacy, and most recently, the Mississaugas of the the New Credit. Today, this meeting place is still the home to many Indigenous people from across Turtle Island and we are grateful to have the opportunity to create our art on this land. In recognizing that this space occupies colonized First Nations territories, and out of respect for the rights of Indigenous people, it is our collective responsibility to honour, protect and sustain this land.